Procyon’s heliacal rising was an important signal to the ancient Egyptians, since the heliacal rising of Sirius marked the flooding of the Nile, dumping rich silty soil on the farms lining the river. (Helical rising means rising at dawn, with the sun, personified as the Greek god Helios.) Procyon told skywatchers the inundation was coming. 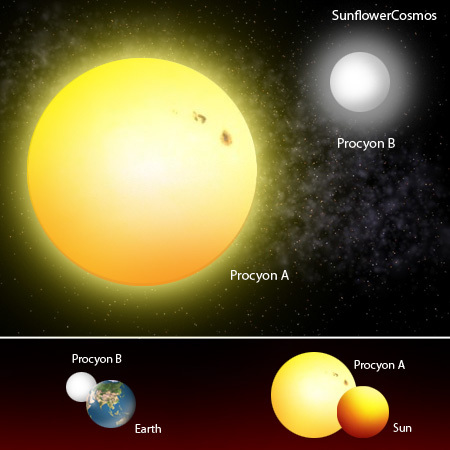 Procyon is a bright star, but near the end of its life and burning out. Moe accurately, Procyon is another binary: a white dwarf (Procyon A) and a larger white star (B) orbits it every 41 years. It is not bright because of the doubling-up; it is one of the nearest stars to Earth. 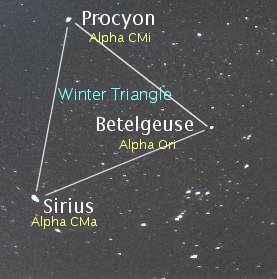 The eighth brightest star in the sky, Procyon forms the Winter Triangle with Betelgeuse and Sirius. The closer to spring, the more it sinks below view: Sirius fades away first, then Betelgeuse, and finally Procyon, which you can see by itself until mid-April in the middle Northern latitudes. The classical myth about the two dogs was that they were the hunter Orion’s hounds. He is visible in the sky all winter, fading out towards summer when Boötes the herdsman takes over. For the Greeks and Romans, it warned of the dog days of Sirius, when weather was hottest, and anyone who could left Rome for the coast. To the Celts the hounds were those of Herne the Hunter (another form of Cernunnos). They also could be the Wish Hounds or Gabriel Hounds of northern folklore. All these British forms trace back to the Welsh Cŵn Annwn, the Hounds of Annwn. These belonged to either Arawn, the king of the otherworldly kingdom Annwn, or else to Gwyn ap Nudd. To the Norse it was the Torch Bearer or Waver. Nigel Pennick sees it as a harbinger of Loki’s later appearance in the sky, for the Midwinter face-off between the gods and the giants. The star Sirius was Loki’s Brand, and since the Völuspá mentions that the fiery giant Surt (Burnt) and his troops come to fight the gods along with the trickster god, perhaps Surt was the Torch Bearer. The Inuit saw it as the body of a murdered man, Sikuliarsiujuittuq. He was enormously fat, and his name translates as “the one who never goes onto the newly-formed sea-ice”. This was because his weight kept him from hunting seals or ice fishing, so he stole his food from slenderer Inuit. As winter wore on and the sea-ice got as thick as the ice round the land, the others began to encourage Sikuliarsiujuittuq to come out hunting with them. He eventually went, and all was well until the hunters made camp for the night out on the ice. The hunters conned him into letting them tie him up, pretending that this was a hunting ceremony. After he fell asleep, one of the hunters stabbed him with a harpoon. He burst his bonds and flew into the sky, but he died anyway. (Later his wife avenged his death by killing the hunters during the wake for Sikuliarsiujulttuq.) Procyon rises in February in the Arctic, a reddish star hanging over the sea ice. PS – Once again I have a superhero link for a star: Canis Minor of New Earth (DC). Bayley, Michael 1997: Caer Sidhe Vol. 1: The Celtic Night Sky, Capall Bann. MacDonald, John 1998: The Arctic Sky: Inuit Astronomy, Star Lore and Legend, Royal Ontario Museum and the Nunavut Research Institute. Pennick, Nigel 1994: Practical Magic in the Northern Tradition, Thoth Publications, 2nd revised edition. This entry was posted in Astronomy, Egyptian, Mythology, Norse, Stars, Welsh and tagged constellation, dogs, Inuit on March 17, 2015 by solsdottir.